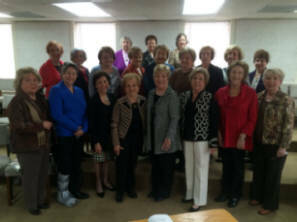 The Encouragers Class is a group of ladies 59 years of age and up who love the Lord and enjoy meeting to study His Word. Some of us are married and some of our husbands have gone to see our Heavenly Father. We would also be happy to have single ladies in our class. We take up small weekly offerings in our class which are in addition to our tithes. This provides us with the means to help in any given situation, such as the Empty Stocking Fund and the mission offerings. We are not limited to missions, however, since some of our funds are used in other benevolent ways. Prayer is an important part of our class. We pray in class but during the week if there is a need, we contact each other immediately to pray for the needs of others. Our beloved teacher, Mary Smith, came to us from California several years ago. She is faithful to our class and is a big part of our church. She is an encourager to everyone she meets. Mary spends so much time in preparation of our lessons, but she is always willing for us to add our thought, ideas, and interpretations. We have a lot of discussion in our class and every member feels free to express their opinions. You can find our classroom by entering Building B on South Green Street, across from the main parking lot and the new multi-purpose building. Our classroom is on the first floor in the hallway to your left in the first classroom on the right. 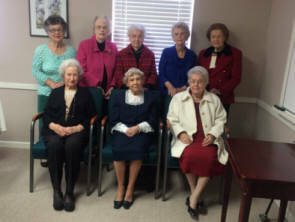 The Lydia Class is made up of ladies who are about 65 to 75 years of age. Our main purpose is to study the Bible week by week so that we can better learn to apply spiritual truth to our daily lives. Our class sessions are marked by some lecture, some discussion, and some questions and answers. We also seek to be supportive of local church projects and a number of mission enterprises such a youth mission trips and a medical mission team from our church that goes to Zambia in East Africa each year. We also are concerned with the ministries of the House of Care and the local Cancer Car project of the Ministerial Association. One of our great joys is helping members of our congregation when they have special needs. Our teacher is Linda Miles. Linda grew up in Thomaston and enjoyed a career in nursing. She is married to Theo Miles. They have been members of First Baptist Church for many years. She also serves as one of our church�s organists. The class has two assistant teachers. Beth Rhodes, wife of Wallace Rhodes, has been a part of our church for 42 years. Catherine Harris, wife of Robert Harris, has been a member of First Baptist since 1998 and is currently the administrative assistant to Pastor Bill Barber. You can find our classroom by entering Building B on South Green Street, across from the main parking lot and the new multi-purpose building. Our classroom is on the first floor in the hallway to your left in the last classroom on the left. Just look for the sign by the door. The Friends Sunday School Class began about four years ago. When the leadership committee began to ask for teachers, one of our members was approached about teaching the sixth grade class. As she prayed about this challenge, the Lord spoke and told her that she was not to teach that class, but she was to begin a class for women going through special circumstances. The class began at a snail�s pace and at times it was wondered if the Lord had really wanted this class formed. A prayer was said and the Lord again affirmed. He wanted the class. He said that He would send the ones He wanted to be in the class and our job was to welcome and love them. Five minutes later a new member walked through the door. This class is made up of women of any age. God sending you to us is the only requirement. The women in our class are from all stages of life: single, divorced, or married. We are a support group. We are friends who care. While many came to join the class in stressful times in their lives or when they felt they didn't quite fit in, they have stayed to help others who come. They stay because they are friends and know how important it is to have Christian friends who care about them. They stay to have a stronger relationship with God. Though our class is small, we have raised money for the Lottie Moon Offering. Last year we purchased toys, clothes and food for two Empty Stocking Fund families. The class has evolved to be a mission minded, caring, praying group--one who reaches out to others in difficult times. You can find our class by coming into the Green Street entrance of Building C, our new multi-purpose building. After you come through the lobby, we are the second classroom on the right on the main floor. 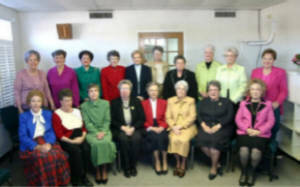 The Gleaners Class is a group of ladies approximately 49 to 59 years old. We range from stay-at-home or working moms to new grandmothers. Many of us are members of the "sandwich generation" with responsibilities to both children and parents. We are single, single again or married. Everyone is always welcome. We enjoy studying God's word together every week and learning fresh ways to apply it to our daily lives. During this past year our activities included providing bikes, toys, clothes and food for three Empty Stocking families; taking up weekly offerings for a local Kitchen Ministry; providing meals for ill or grieving class members; and, most importantly, praying for each other. We invite others to join us as we strive to be better disciples of Jesus. Beth Newman has been the very dedicated teacher of the Gleaners for over 30 years. Her lessons combining Biblical knowledge with timely illustrations initiate interesting class discussions and help class members to answer life's questions. Beth is a retired speech therapist. She is married to Rev. Leon Newman, who served as Minister of Music at First Baptist Church for 26 years. You can find our class by coming into the Green Street entrance of Building C, our new multi-purpose building. After you come through the lobby, we are the third classroom on the right on the main floor. The Bonoth class is made up of 27 ladies over 60 and consists of marrieds, singles, singles again, retirees, semi retirees, mothers and grandmothers and great-grandmothers; however, any ladies who wish to join us may do so. We meet to study the literature and scriptures, to participate in class discussions, and to pray for our classmates, fellow church members, friends and families, and community members. We reach out to classmates and their families when the need arises and provide support to them through meals, donations and memorials. We show our Christian support to a family through the Empty Stocking program at Christmas. Additionally we provide financial support to "Pass the Salt" , House of Care, Food Pantry, Youth Mission trips, Youth Camp, Youth Sunday breakfasts, Lottie Moon, Annie Armstrong, the Sanctuary Renovation Fund, Flowers for the Easter Cross, Cancer Car, Flowers for the Church, Trunk or Treat, Mission trips, and other memorials to our Church. Our teacher is Bobbie Johnston who has been a member of our church since she was twelve years old. She is married to Billy, has two sons and two grandchildren. She is a retired school teacher with the local school system. She is well prepared to lead the class, and does extensive background research to help us better understand the scriptures and how to relate this to our everyday Christian life Our class meets the second Tuesday each month at 12:30 for lunch and fellowship in the Fellowship Hall C Building.. Our class is currently meeting on Sunday morning in the choir room upstairs in the main building. After renovation of the Sanctuary is completed, we will be located in C building (our newest building) just off the parking lot. Please visit our class and join us for good Christian Fellowship. The Heart to Heart works toward equipping women to become fully devoted followers of Jesus through involvement in small group Bible studies, prayer groups, and special events for women. For more information about becoming a part of this Women's Enrichment Ministry at FBC, contact Jenny Adams. 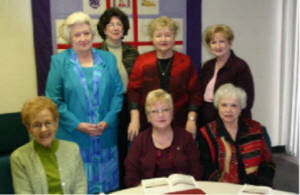 The Women of Faith Choir (WOF)is one of the special interest groups that originated with the Heart to Heart Ministry. Rehearsing two or three times a month, the group has developed a bond of sisterhood which is evident with each song they present to the FBC congregation and other places they minister. Vicki Smith, the group leader, says, "My goal for this group is to include ladies of all ages who like to sing and not just those who have great voices. If you can carry a tune and can smile, you are welcome in this group." The Ladies Prayer Breakfast, open to all ladies of the church and community, meets every Tuesday from 9-10:30 am the back left corner of the Tasty Shop located on East Main Street. Jenny Adams and Julie Love assist Vicky Smith in the leadership of this group. On average, eight to twelve women attend weekly. Some have breakfast, and some just have coffee as they talk about mutual interests. Devotion time is lead by different ladies each week ending with time to share prayer requests. 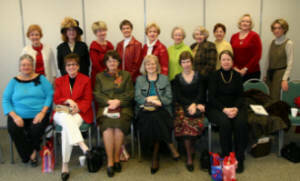 This class is comprised of ladies ranging in ages from 80 to 90. It is taught by Evelyn Mitchell. She is a retired High School and College teacher. Upon retirement she became a Southern Baptist Mission volunteer as a teacher in a girl's school in Japan. We are small in number and welcome new members. Our class is located in Building A through Lee street entrance at the end of the main hall on the left past the Library.